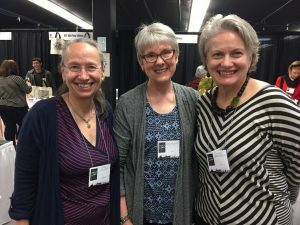 This year SGCI (Southern Graphics Conference International) came to us in Portland, Oregon! SGCI: FLUX was our busiest conference to date and a big thank you to those who stopped by our booth. This year we tried a few new things. 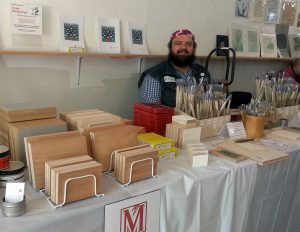 Alex Prentiss, owner of McClain’s, and McClain’s employee and Daniel Jasa teamed up with artist Mary Brodbeck for a moku hanga and tool sharpening demonstration. The demo was so well attended that the room capacity was maxed out. Another event to keep in mind is the biennial MAPC (Mid-American Print Council) conference. This year there are two hosts, Indiana University Southeast and University of Louisville. The theme is Print Matters: Printing Matters. Interested in participating? There is still time! Panels, themed exhibitions, demonstrations and exchange portfolios are still open but deadlines are quickly approaching. Visit the MAPC website for further information. Andrew Lorish is a native Oregonian and came on board at McClain’s when Carolyn departed for her many adventures in South America at the beginning of the year. Andrew’s background is in printmaking and painting. He received his BFA at the School of the Art Institute of Chicago and MFA in Visual Studies from Pacific Northwest College of Art. 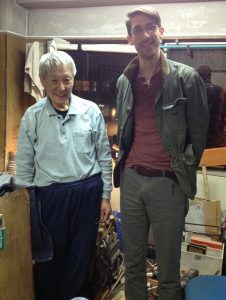 In late March of this year, Daniel was fortunate to not only visit Japan for the first time but also to spend a day with Watenabe-san who sharpens the tools sold at McClain’s. This trip coincided perfectly with Daniel’s interest in tool sharpening. He is currently working on starting up a tool sharpening business of his own; more information about this service will be available soon. To the left is a picture of Daniel with Watanabe-san. If you have ever purchased a tool and/or sent your tool back to Japan for the professional tool sharpening service, this is the man who put the edge on them. Watenabe-san has been sharpening tools for 60 years, starting in his late teens. So if you are ever discouraged while sharpening tools on your own remember sharpening is a craft in its own right and some having devoted a lifetime to mastering the technique. It’s ok if you do not master it right away and remember that you can always send your McClain’s tools back to us to be sent back to the expert. Watershed Grey is back at McClain’s! PNCA (Pacific Northwest College of Art) in Portland, Oregon worked with Gamblin to create a limited edition recycled ink. The mix of recycled pigments is different with each batch, so Watershed Grey is always unique and never repeated. When it’s gone, it’s gone until the next batch is made.